It's no joke--I haven't been to a public library in six weeks, which is a very long dry stretch for me! (Except for a month or so before I move, when I don't set foot in a library for fear of losing a book in the move, I usually go to the library regularly.) It's just that lately, the library is never open when I have time to go. The local library is open from 10 am to 6 pm most days, and until 8 pm on Tuesdays. That's still too early for me to get there most weeks. It's not open on Sunday at all, and the Saturday hours don't help me much. I don't blame the library, though. They don't have enough money to stay open more. I blame the state and the city for not providing better funding. I would pay $5/month more in taxes if it meant that the library was (were?) open more. It's an interesting philosophical question--where is the library if so many of its resources are available online and if working people can't go because it's never open? 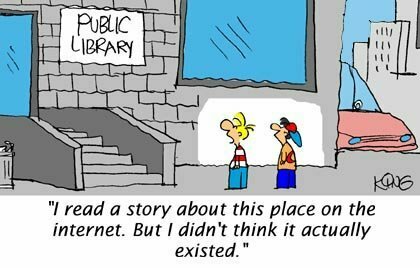 Will the brick and mortar library be replaced by the library-on-the-Internet? It sometimes appears that way. Would that be a good thing? I think I would miss physical libraries if they disappeared. I once went into the NYPL to use one of their electronic resources and I sat in a room full of computers, with other people tip-tapping away next to me...and it was kind of sad. Not like the somber, stately reading rooms of yore. I'm no luddite by any means, but I sure do love paper books. Interesting.... You'd pay $5 more in taxes for the library to be open more, and I'd rather pay $5 less in taxes for it to be opened less. Give me $10 back on my taxes, and I'd be fine with no libraries at all. I haven't been to a public library in years. 5 years? 10 years? I can't even remember.